The dream of using the same language on the server that you use in your iOS apps is calling out to you! But maybe you’ve never done server-side work before? 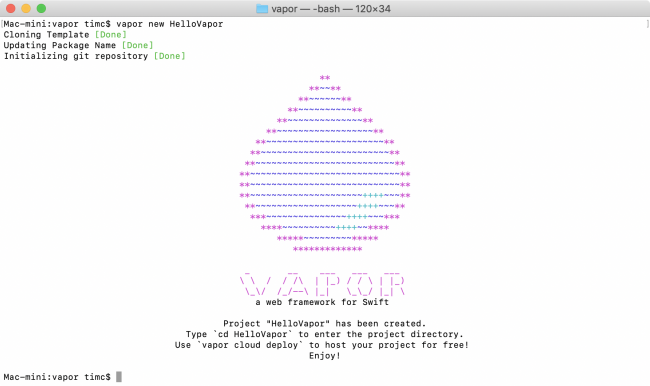 Beginning a project in a new domain and using a new technology can be daunting, but Vapor makes it easy to get started with server-side Swift. Vapor even provides handy scripts to make sure your computer is configured correctly. 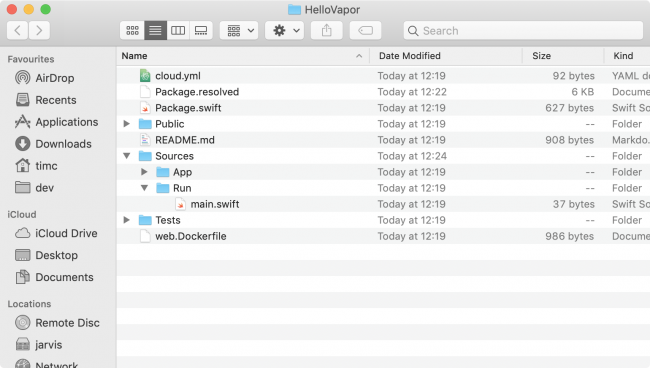 In this tutorial, you’ll start by installing the Vapor Toolbox, then use it to build and run your first project. You’ll finish by learning about routing, accepting data and returning JSON. The first step in beginning Vapor development is to install the Vapor Toolbox. Creating new apps from templates. Building and running projects using the Swift toolchain. Deploying projects with Vapor Cloud. Before you can install the toolbox, you need to ensure your system is compatible. To do this, you run the Vapor Check script, which verifies you have the necessary version of Swift installed. This command also works on Linux. If you receive errors when running this script, you’ll need to install Swift. On macOS, simply install Xcode from the Mac App Store. On Linux, use APT to install it as described below. Vapor 3 requires Swift 4.1 or 4.2, both in Xcode and from the command line. Vapor uses Homebrew to install the Toolbox. If you don’t have Homebrew 2 installed, visit https://brew.sh and run the installation command. Everything you build with Vapor will work on any version of Linux that Swift supports. At the time of writing, these are Ubuntu 14.04, Ubuntu 16.04 and Ubuntu 18.04. The Vapor Toolbox works in exactly the same way, with the exception that you can’t use Xcode projects on Linux. You install Vapor on Linux using the Vapor APT repository. Vapor maintains an open source APT repo at https://github.com/vapor/apt, which serves the same purpose as Vapor’s Brew tap. It allows for easy installation of packages and manages all the dependencies for you. When you install Vapor, it also installs Swift for you. This tutorial uses Ubuntu 16.04 throughout when referring to Linux, but the other supported versions of Ubuntu should work in exactly the same way. Note: You may need to install curl first before you can run this command if you are starting with a fresh Ubuntu image. Run sudo apt-get install curl -y to do so. Setting up a Vapor project can seem complicated at first as there are a number of required files and directories. To help with this, the Toolbox can create a new project from a template. The default template is a simple API template, but it also has templates for web sites and authentication. You can even create your own templates. cd is the “Change Directory” command and takes you into the project directory. This builds the app. It can take some time the first time since it must fetch all the dependencies. This runs the app. If the macOS Application Firewall pops up asking you to allow network connections, click Allow. The template has a predefined route, so open your browser and visit http://localhost:8080/hello and see the response! You can press Control-C in Terminal to stop the running app. Notice there’s no Xcode project in your template even though you’ve built and run the app. This is deliberate. In fact, the project file is explicitly excluded from source control using the .gitignore file. When using SPM, Xcode projects are discardable and regenerated whenever you make project changes. An SPM project is defined in the Package.swift manifest file. It declares targets, dependencies and how they link together. The project layout is also different from a traditional Xcode project. There is a Tests directory for tests. There is a Sources directory for source files. Each module defined in your manifest has its own directory inside Sources. Your sample app has an App module and a Run module, so Sources contains an App directory and a Run directory. Inside the Run directory, there’s a single main.swift file. This is the entry point required by all Swift apps. On iOS this is usually synthesized with a @UIApplicationMain attribute on the AppDelegate. The template contains everything you need to set up your app and you shouldn’t need to change main.swift or the Run module. Your code lives in App or any other modules you define. This section uses Xcode. If you’re developing on Linux, use your favorite editor, then use the commands vapor build and vapor run to build and run your app. Add a new route to handle a GET request. Each parameter to router.get is a path component in the URL. This route is invoked when a user enters http://localhost:8080/hello/vapor as the URL. Supply a closure to run when this route is invoked. The closure receives a Request object. Return a string as the result for this route. In the Xcode toolbar, select the Run scheme and choose My Mac as the device. Build and run by clicking the Run button or pressing Command-R. You may be prompted by Xcode to enter your password on this first run, so go ahead and do so. Once you see the “Server starting on http://localhost:8080” message in the console, visit http://localhost:8080/hello/vapor in your browser. Important note: In Xcode 10 and Swift 4.2 you may see two warnings. The first is a project warning saying the project can be converted to Swift 4.2. The second is a deprecation warning in the NIOOpenSSL package. You can safely ignore these. What if you want to say hello to anyone who visits your app? Adding every name in the world would be quite impractical! There must be a better way. There is and Vapor makes it easy. Use String.parameter to specify that the second parameter can be any String. Extract the user’s name, which is passed in the Request object. Use the name to return your greeting. Build and run. In your browser, visit http://localhost:8080/hello/Tim. Try replacing Tim with some other values. Most web apps must accept data. A common example is user login. 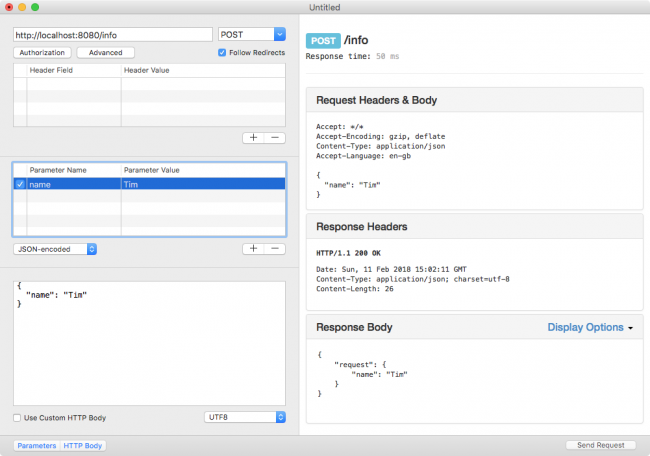 To do this, a client sends a POST request with a JSON body which the app must decode and process. Vapor 3 makes decoding data easy thanks to its strong integration with Swift 4’s Codable. You give Vapor a Codable struct that matches your expected data and Vapor does the rest. Create a POST request to see how this works. This tutorial uses the RESTed app, available as a free download from the Mac App Store. If you like, you may use another REST client to test your APIs. Add a single parameter called name. Use your name as the value. Select JSON-encoded as the request type. This ensures that the data is sent as JSON and that the Content-Type header is set to application/json. If you are using a different client you may need to set this manually. This struct conforms to Content which is Vapor’s wrapper around Codable. Vapor uses Content to extract the request data, whether it’s the default JSON-encoded or form URL-encoded. InfoData contains the single parameter name. Adds a new route handler to handle a POST request for the URL http://localhost:8080/info. This route handler returns a String. The route handler accepts a Content type as the first parameter and any path parameters after the at: parameter name. The route handler decodes the data and passes it to the closure as the second parameter. Returns the string by pulling the name out of the data variable. This may seem like a lot of boilerplate to extract a single parameter from JSON. However, Codable scales up and allows you to decode complex, nested JSON objects with multiple types in a single line. Vapor also makes it easy to return JSON in your route handlers. This is a common need when your app provides an API service. 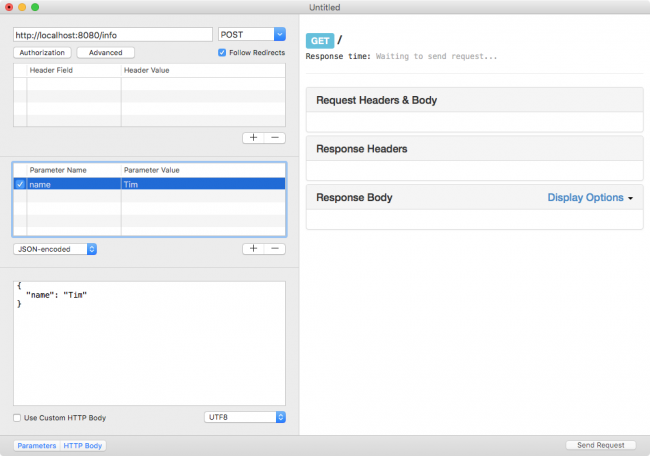 For example, a Vapor app that processes requests from an iOS app needs to send JSON responses. Vapor again uses Content to encode the response as JSON. This struct conforms to Content and contains a property for the request. The route handler now returns the new InfoResponse type. A new InfoResponse is constructed using the decoded request. In this and future Vapor apps, you may encounter errors in your projects. There are a number of steps to take to troubleshoot any issues. This regenerates your project like the first time you created the Xcode project. This can fix issues such as missing files or project configuration errors. This uses the underlying swift package update command to pull down any updates to your dependencies and use the latest releases you support in Package.swift. Note that while packages are in the beta or release candidate stages, there may be breaking changes between updates. Remove the .build directory to remove any build artifacts. Remove your .xcodeproj to delete the Xcode project and any misconfigurations. Remove Package.resolved to ensure you get the latest dependencies next time you build. Remove derived data to clear extra Xcode build artifacts. The above steps usually fix most issues you might encounter that aren’t caused by your code. If all else fails, head to Vapor’s Discord server. There are thousands of developers discussing Vapor, its changes and helping people with issues. Click the Join Chat button on Vapor’s web site: https://vapor.codes. You can download the completed project for this tutorial using the “Download Materials” button at the top or bottom of this page. This tutorial provided an overview of how to get started with Vapor and how to create basic routes. If you enjoyed this tutorial, why not check out our full-length book on Vapor development: Server Side Swift with Vapor?